This adorable flower pendant features polished white gold and shimmering gemstones that simply light up the piece with a brilliant display of color. This 6 x 4 mm Oval-Cut Amethyst and Diamond Flower Pendant in 14K White Gold has a delicate feel to it, making it appealing for its interesting shape and design. At the center of the pendant sits a lovely oval-cut amethyst (6 x 4 mm, 0.6 ct.) which provides a splash of deep purple to focus the eye on. Around the amethyst is an animated display of white diamonds (0.20 t.c.w. ), arranged to appear as though they are petals on a dainty flower. An added element to the design is the polished buttons of gold that also function as part of the stone settings. At the top of the pendant is a simple "v"-shaped bale to attach to the chain. 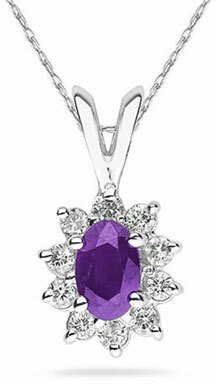 This floral-inspired amethyst and diamond pendant is both a dainty and decorative. We guarantee our 6mmX4mm Oval-Cut Amethyst and Diamond Flower Pendant 14K White Gold to be high quality, authentic jewelry, as described above.